Smoked pork chops can be cooked in many several recipes, not just pan fried. 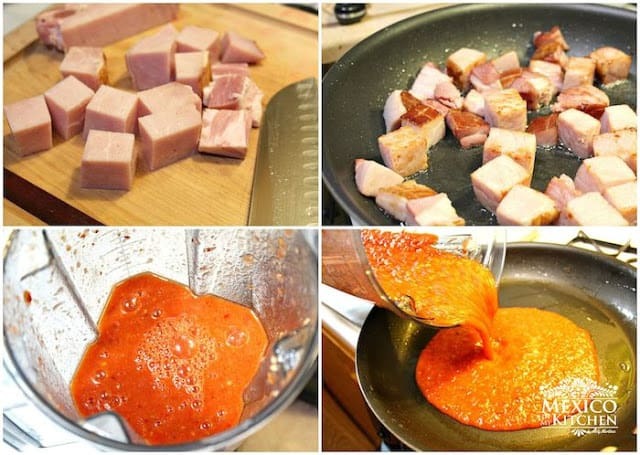 This recipe is a very popular way to cook smoked pork chops in México because almost everyone has at home all the ingredients in their kitchen: tomatoes, onion, garlic and canned chipotles. You can either cook the pork chops whole or chopped like the way I present them here. I know most family gatherings in the summer prefer a traditional barbecue where, the men of the family take charge of the grill and cook the classic steaks, hotdogs, and hamburgers. But seriously, the weather this summer has been so hot that I do not even want to think about preparing a cookout. For these hot days when you want to enjoy a family gathering but want spend less time on the grill, then organize a potluck gathering. In México we used to do that almost every weekend when I was living in Toluca. Each family will bring a dish, usually a stew in a clay pot, a salad or dessert and then we just turn the fire on and everyone will place their pot to warm the meal and the tortillas. Less time cooking and more time enjoying the family and the outdoors! 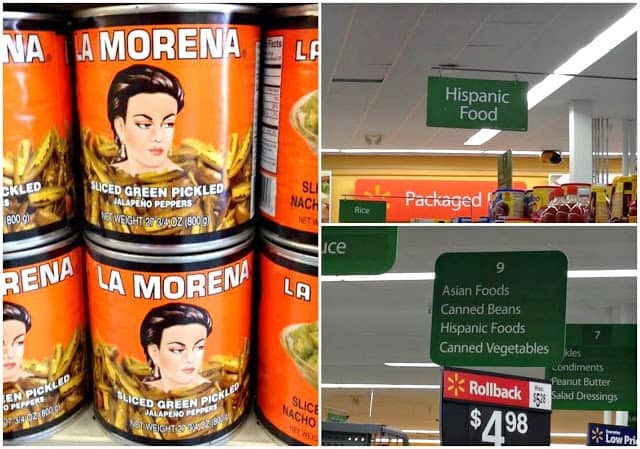 I consider myself a conscious buyer and for this reason, I like to buy some of my Mexican groceries at Walmart, right at the Hispanic Food section. Years ago this was not possible, but now I can even find “La Morena” products here! 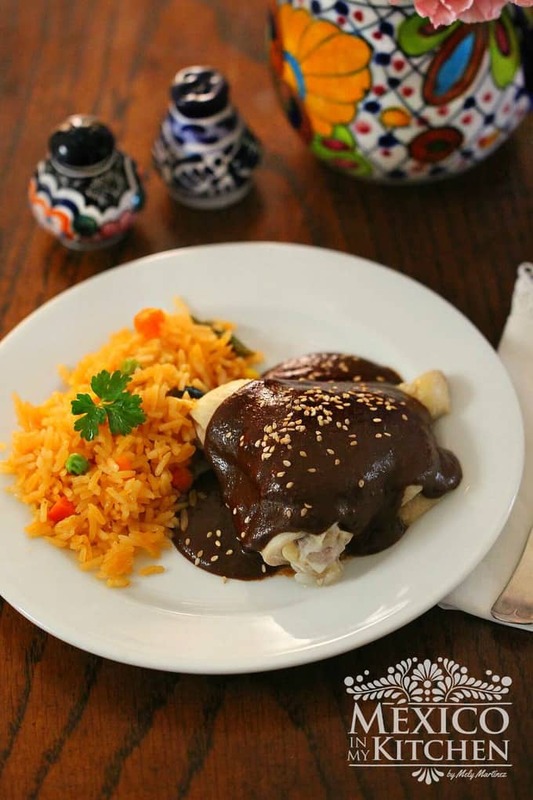 I know that not everyone has access to authentic Mexican products, but if you try to find them, they really add the authentic flavor to our Mexican dishes. While the meat if frying, place tomatoes, onion, garlic, La Morena canned chipotles and ½ cup of water in your blender. Process it until you have a very smooth salsa. Once meat is golden brown, remove from the skillet and set aside. Drain any excess fat from the skillet and place back to medium-high heat and add the Chipotle salsa. Once it starts boiling reduce heat to simmer for 5 minutes. Return the cubes of smoked pork chops to the skillet, season with salt and pepper, and keep simmering for about 6 more minutes. The salsa will reduce and the flavors will be well blended. Serve with white rice and warm tortillas. Smoked pork chops can be cooked in many several recipes, not just pan fried. This recipe is a very popular way to cook smoked pork chops in México because almost everyone has at home all the ingredients in their kitchen: tomatoes, onion, garlic and canned chipotles. Cut the pork chops into bite-size cubes, about ¾-In. Heat oil in a large skillet and stir-fry the meat for about 6-8 minutes until golden brown. Return the cubes of smoked pork chops to the skillet, season with salt and pepper, and keep simmering for about 6 more minutes. The salsa will reduce and the flavors will be well blended. Serve with white rice and warm tortillas. Some cooks like to prepare the pork chops whole, that is a personal choice. If you don’t want your stew too spicy, reduce the number of peppers. For more ideas using those canned chipotles, visit “La Morena” website and start cooking! Hola! These are delicious, I also like to add sliced onions, sliced serranos and corn or small cubed calabacitas after I pour the sauce in there. So delicious with the veggies in there!